276 pages | 68 B/W Illus. If your health care organization is typical, you were successful in getting your electronic medical record (EMR) system installed on time and within budget. You declared victory and collected some money from meaningful use. But very quickly, you realized you were not getting the expected return on your investment. So you started the "optimization" process to make refinements, do some stuff over, and get it right this time. 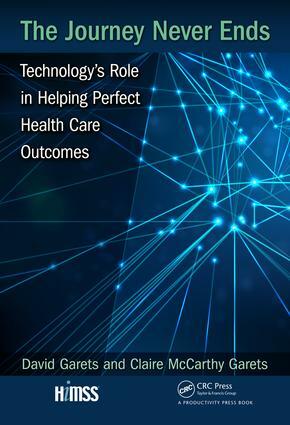 The Journey Never Ends: Technology's Role in Helping Perfect Health Care Outcomesis dedicated to helping you derive value from your investment in the software and the people in your organization. It describes some of the major initiatives, post EMR implementation, which most health care organizations now face. Most of these are transformational in nature, and instead of being IT projects, they are business or clinical initiatives with an IT component. If you or your board thought you were done spending large amounts of money on IT after implementing your EMR, you’re dead wrong. Welcome to the new reality! "The authors in this outstanding compilation of post-EMR needs and benefits will further prepare you for what’s required and what’s possible." Dave Garets is an internationally known industry analyst, author, and speaker on healthcare issues. The cocreator of the HIMSS Analytics EMR Adoption Model, he was elected to HIMSS 50-in-50, the 50 most memorable contributors to healthcare IT in the last 50 years. In his 26-year career in healthcare, Dave has been a hospital CIO, group vice president and head of the healthcare IT research organization at Gartner, Inc., president and CEO of HIMSS Analytics, board chair and EVP of HIMSS, EVP of Healthlink, and general manager and executive director of The Advisory Board Company. Claire McCarthy Garets, MA, FHIMISS, is an organizational sociologist and an internationally recognized change management and technology adoption strategist. She has more than three decades of experience supporting diverse health care organizations through transformative technology implementations. In addition to her IT work, Claire’s change leadership experience includes mergers, downsizings, and reorganizations. Claire is the CEO of Change Gang, LLC, a boutique healthcare change management consulting firm. She specializes in transformational leadership development; supports HCOs in electronic medical record planning, implementation, and optimization; and advises IT companies. She earned an MA in sociology from the University of Montana.